The team at Out of the Park Developments are well known in the sports simulation world for their work on Out of the Park Baseball. However, the team is making sure fans get a taste of the action by branching out into other sports. Two years ago saw the launch of Franchise Hockey Manager, the company’s first attempt to jump into the hockey world. Though it was a decent initial offering in the market, the game ultimately left a lot to be desired. Bugs plagued a game that had so much potential to be great yet fell short because of problems. 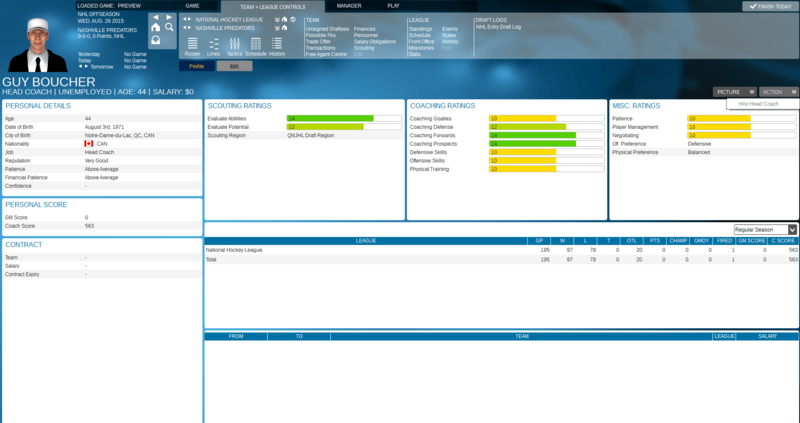 With Franchise Hockey Manager 2, the developers decided to make sure things were done right this time around to bring forth a game that will be held in the same regard as the popular OOTP Baseball franchise. The first thing you notice when loading up Franchise Hockey Manager 2 is just how much cleaner the design is, and how much easier it is to navigate around. In the original, it became tedious to find the menus needed to perform certain tasks. That appears to be over with this year’s installment. The new game presentation system is a big step up for players, and it’s actually visually appealing compared to the first installment. 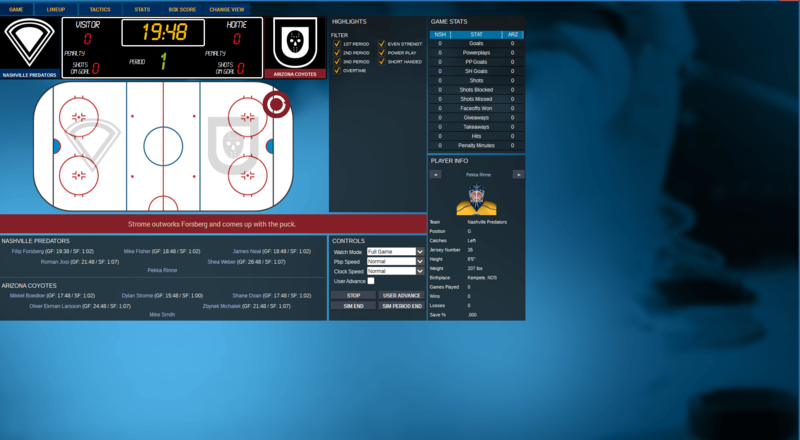 Instead of just a wall of text informing you how a game is playing out, players are shown a screen that resembles what you’d see on an NHL.com IceTracker page. The amount of work you can choose to do is astounding in this year’s game. From lines to strategies to choosing how to split minutes amongst your players, game-by-game preparation can take as little or as long as you’d like. You also have every option available to you as a General Manager when it comes to, well, managing the look of your roster at both the NHL and AHL level. Scouting seems to be improved over the previous version, with better scouts actually being more accurate with their findings. A.I. logic also seems to have taken a step towards the better side of the spectrum with fellow General Managers being better negotiators in terms of trades and free agent contracts. The one main issue that appeared during the preview build is the inability to hire a head coach when acting as the General Manager. It was simple enough to fire the head coach, but to actually hire one was impossible. The option just appeared grayed out though no bench boss was under contract. Also, sometimes the controls don’t like to respond when you want them to, but that’s an issue that should be worked out when the full build launches. 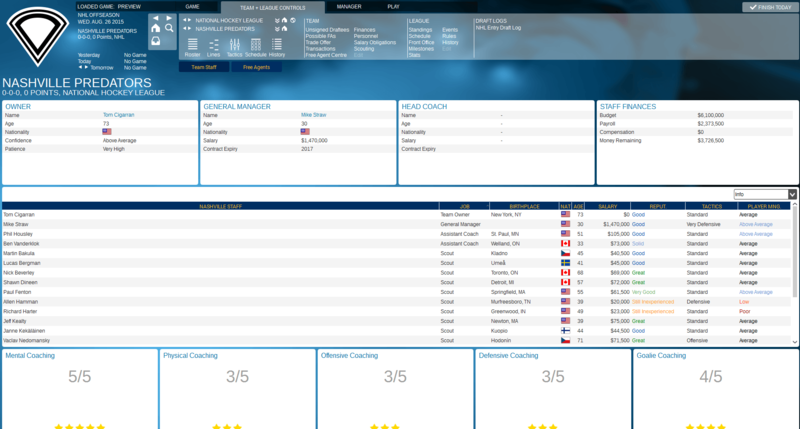 Franchise Hockey Manager 2 is definitely trying to take all of the good that OOTP Baseball has done, and twist it into a way that works with a hockey game. So far, it’s working quite nicely. The game is heading in the right direction, and should have many fans excited when they load it up for the first time. And that’s just the sense you get with a preview build of the game. Be sure to check back after Franchise Hockey Manager 2 launches on September 28 for a full review of the game.